Guide in 'Crafting & Gathering' published by Caimie Tsukino, Aug 25, 2017. Since the release of the Heavensward expansion, the tips/hints on rotations in Part 2 of the guide no long applies. Each level beyond lvl 50 significantly changes your rotations for each of the old 1 star to 4 star items. e.g. by the time you reach level 53 or 54, you can easily 3 shot an old 3 star item with plain Careful Syn II. i70 Artisan Offhand, i60 Artisan Apron and other meldable i60 gear are no longer BiS (Best in Slot). So don't bother with Mastercraft Demimateria, Ehcatl Sealants or excessive overmelds anymore. All you need is pretty much just lvl up, and you can already handle any starred items with ease. The Lucis tool is still a great thing to have. If you have it, or very close to having it, you should get it. It's going to help a lot, because it has very impressive powers and can be worn as early as level 50 (and its dye-able, gigantic in size, and sooo pretty!). The Lucis tools can pretty much take you through lvl 50 to 57/58. But if you are not close to having Lucis, then don't bother. Just level up first, and make use of the new tools from Heavensward. Part 1 of this guide still have a lot of valuable information for young rising crafters who have not reached lvl 50 yet. This is Caimie! I have returned for Stormblood! The Survey Corps (AoT) on Zalera is still as prosperous as it has been, and is actively recruiting. Our FC house is located at Uldah Goblet Ward 1 Plot 5, and my former personal house at Ward 1 Plot 1 (#1 house in Uldah Goblet) has been transferred to Lukah Killu, a very lovely and competent lady who is now taking part in leading AoT. If you're interested in joining, please feel free to contact any of the AoT members, such as Lukah Killu, Elaine Strachan, Gnari Vah'mahl, Birdy Rei, Nabeshin Nabeeeeshinn, Burnin Gundam, Darth Rok, Michiro D'bb, Hisoka, Asellus, Mar'ina etc. AoT always welcomes friendly people joining! P.S. My personal house is at Zalera, Shirogane, Ward 10 Plot 13. Please feel free to drop by and say hello! This guide will be slightly different from most basic crafting guides. Apart from some basic information & mechanics, this guide is intended to be a "Crafting Encyclopedia" to inspire rising crafters to achieve a higher level of understanding in crafting. It may be longer & wordier, but in the end I hope someone can benefit from my experience, avoid the mistakes that I made, and able to succeed and enjoy end-game crafting in FF14. As of June 2015, I have received some comments about how the rotations in this guide are vague / not well-presented. Well, what rotation?? My guide doesn't have a "Rotation Chapter" at all!! It is something that I intentionally did here. If you came here to look for rotations, you have come to the wrong place. I do have a "Ch12: Generating a Crafting Rotation" here, but it doesn't throw rotations at your face, or it will just spoil your game. In addition, I don't see copy & pasting rotations as a short-cut to success. Thus, my guide aims at inspiring you to create your own rotations. I may have some rotations listed in spoiler tags, but that's about it. All other things in there are just "hints/tip" to help you develop your own rotations. I recommend people reading the Cross Class Skills description in details (Ch10) & the chapter about generating rotations (Ch12). For starred items, Ch 27 in Part 2 should have given you enough hints. These hints should be sufficient for you to explore & build your own rotations. It is 25th Aug 2017 today, and I can see that this guide is still very popular among learning crafters. I decided to update it, so the information provided will be more accurate. What is the point of crafting? Why should I take up a crafting job? (1) I want to be able to make my own gear/weapons that benefit my main DoW/DoM class! (2) I want to make more gil and be rich! (3) I want to make cute minions & beautiful furniture for my FC house! (4) It seems fun! I think I like it! If (1) is your reason, you need to understand that, although HQ (High Quality) crafted gear are better than the free NQ (Normal Quality) ones you get from your main story quests, most crafted gear are not as powerful as those obtained from loot-rolling in dungeons. Almost any green/pink (background color) gear will slightly outmatch a HQ crafted gear of the same level. But since all the loots in dungeons have to be "rolled", you can’t expect to get everything from dungeons! Therefore, at lower levels, HQ crafted gear becomes a wonderful supplement for items you cannot obtain from dungeons. After your DoW/DoM is level 50, you'll be buying most of your gear with tomes (Tomes of Poetics) from Mor Dhona. Poetics gear (i120) can be further upgraded to i130 using more Poetics tomes to buy Carbontwine/ Carboncoat, and exchange at the NPC "Drake" who stands right next to Gerolt in North Shroud. Any Poetics gear (i120 or i130) will be stronger than a crafted gear (at most i110 or i115 for level 50) for a level 50. However, collecting tomes can be a very slow process. Thus, crafted gear can speed up the process by a lot, allowing faster increase of average item level (avg ilvl), which in turn allowing you to proceed quicker to higher dungeons and trials. 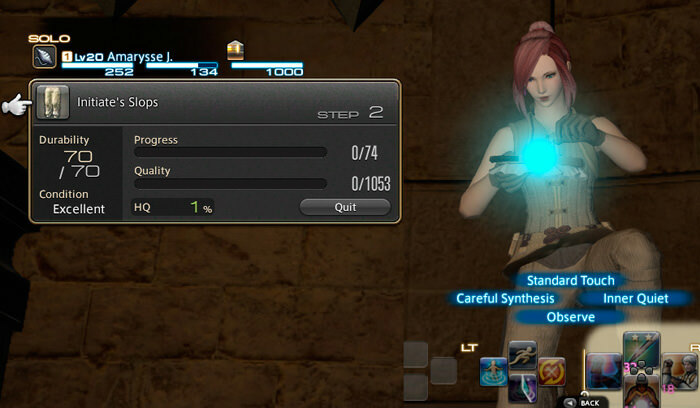 Another cool feature about crafted gear is that they can attach "materia" to tweak your stats (Materia gear guide: http://ffxivrealm.com/guides/how-to-use-materia-to-tweak-stats-of-end-game-gears.38/). But the effort to make those items is enormous. You need to be close to an all-50 crafter, and you need to fully meld the HQ crafted gear with the best materia before you can enjoy the benefit. If (2) is your reason, you need to understand that, although crafting can make more gil, it can also drain your gil. It’s like an investment… the more time & gil you put into crafting, the better stats you’ll acquire and the more expensive items you can craft to sell. The investment you need to make at end-game is in the amount of millions, but the gil return is also in the amount of millions. So think about this carefully, because along the way, you could be very poor depending on how much gil you spend on powering your crafting. If you stop investing gil at a point, you will have a very stable income, but your stats & income will stop increasing. If (3) is your reason, then you can pretty much ignore the word “HQ” in crafting. For minions & furniture, there is no difference between HQ vs NQ. All you need is just completing the item. However, furniture of the highest level is still quite hard to make if you do not have ALL crafting classes at level 50. If you’re careless, you can lose a lot of precious crafting materials. It is recommended that you at least have Waste Not (LTW lvl 15), Piece by Piece (ARM lvl 50), Ingenuity II (BSM lvl 50) & Careful Synthesis II (WVR lvl 50). If (4) is your reason, then, WRONG! It’s not “it seems fun”! It IS fun!!! And you will LOVE IT! Why? Because crafting is like puzzle solving. You get a lot of satisfaction when you beat a tough puzzle. It is also solely dependent on just yourself. You don’t need to rely on anyone else in the game. It’s all in YOU! Furthermore, when you finished crafting an item, your name is imprinted at the bottom of the stats of it. So having a HQ difficult item with your name on can make you feel very proud. You can keep it, you can wear it, you can give it to someone, or you can sell it! The person who wears the gear will forever be seeing your name there, knowing that YOU are the magnificent crafter who made that gear/weapon. The game is designed so that all crafting classes are intertwined with each DoW/DoM. You can’t take up just 1 or 2 crafting classes and expect to fully empower your main DoW/DoM. You need almost everything (except Culinarian) if you want to make all your gear for a single DoW/DoM. But since the most basic gear in the game are the chest piece, pants & weapons. I’m going to suggest the following as your MAIN crafting classes. Gladiator (GLA)/Paladin (PLD) -----------> ARM makes armors, BSM makes weapons. Marauder (MRD)/Warrior (WAR) --------> ARM makes armors, BSM makes weapons. Pugilist (PGL)/Monk (MNK) --------------> LTW makes chest piece/pants/weapons, BSM makes some weapons. Rogue (ROG)/Ninja (NIN) -----------------> LTW makes chest piece/pants, BSM makes weapons, ALC makes the final "pre-relic" weapon. Archer (ARC)/Bard (BRD) -----------------> LTW makes chest piece/pants, CRP makes weapons. Lancer (LNC)/Dragoon (DRG) ------------> ARM makes armors (LNC lvl 17 to start wearing Haubergeon, lvl 23 to start wearing Scale Mail armor), CRP makes weapons. Thaumaturge (THM)/Blackmage (BLM) -> WVR makes chest piece/pants, GSM makes weapons. Conjurer (CNJ)/Whitemage (WHM) ------> WVR makes chest piece/pants, ALC/CRP makes weapons. Arcanist (ACN)/Summoner (SMN)/Scholar (SCH) -> WVR makes chest piece/pants, ALC makes weapons. Notice that this is rather subjective… Honestly, you can pick anything you like, and it’s not gonna hurt. Most importantly, if you aim at becoming an "advanced crafter", you'll be aiming at all-50 anyway. Even if you’re only interested in 1 or 2 crafting classes, the best way to level crafting is really to take up ALL crafting classes at once, and level them all to level 15 before focusing on 1 or 2. This is because you get "Cross Class Skills" at level 15. By achieving all-15, you can acquire all these skills which can be used by ALL crafting classes, and it will make your crafting life a lot easier (See "Cross Class Skills" section below for more details). The game is designed that all crafting classes are inter-dependent on each other at certain areas. So by taking up all crafting classes, the crafted products from one class will support another. E.g. metal ingots from BSM/ARM are constantly used by LTW/CRP, lumbers from CRP are frequently used by BSM, pieces of cloth from WVR are often used in LTW etc. So having more classes is always beneficial. But of course, leveling all crafting classes at the same time is almost impossible at higher levels (unless you’re oh-so-patient). So when you reached a point where you just can’t level them all, you will have to just focus down on a few classes, and buy stuff from market board to support your main crafting classes. The 3 classes will give you the most important lvl 15 Cross Class Skills to allow you to HQ things at lower levels (For details of how to use these skills, please visit Ch10: Cross Class Skills below.). After getting these 3 to lvl 15, continue with the remaining classes for all lvl 15 Cross Class Skills. The remaining lvl 50 Cross Class Skills are also very important, but at least with the above 4 skills, you will be able to construct a basic "Byregot rotation" (see Ch12: Generating a Crafting Rotation), which allows you to start entering "end-game" of crafting. As of Aug 2017 in Storm Blood, SINGLE CLASS crafters have become more viable. Specialist skills have become more powerful than ever, and regular crafting skills like Careful Syn III, Hasty Touch II, Manipulation II, Rapid Syn II, Prudent Touch etc. have made single class crafters more capable of getting the job done. However, the regular crafting skill "Byregot's Brow" is is still inferior to lvl 50 Carpenter's "Byregot's Blessing" when Inner Quiet stack is 6 or above. 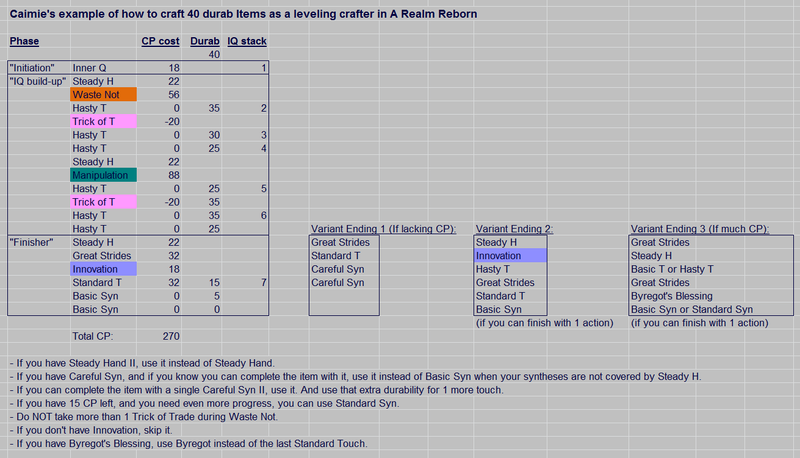 Also, although the regular crafting skill "Careful Syn III" is more powerful than lvl 50 Weaver's "Careful Syn II" and "Hasty Touch II" has a higher success rate than lvl 15 CUL's "Hasty Touch", "Careful Syn III" and "Hasty Touch II" are not CP-FREE skills. So they're not exactly completely replaced by their old cross class counterparts. Moreover, cross class skills like lvl 50 Armorer's Piece by Piece, lvl 50 Blacksmith's Ingenuity II and lvl 50 Alchemist's Comfort Zone received no replacements in Storm Blood, and yet they're still very regularly being utlized. Thus, many of these level 50 cross class skills are still a big bonus to have in Storm Blood. In summary, although one does not need to be an All-70 to be an effective crafter in Storm Blood, I would still highly recommend one getting at least All-50 status (Muscle Memory from lvl 54 CUL and Maker's Mark from lvl 54 Goldsmith are also recommended to obtain). The main sources of a crafting class's "craftsmanship" stats come from the mainhand tool, offhand tool & chest piece. WVR makes most of the chest pieces & pants for most of the crafting classes & gathering classes, and some hats & gloves too. Having a good WVR just makes life so much easier for crafting. Similarly, BSM makes all kinds of mainhand/offhand tools, and it’s just so beneficial to all crafting & gathering classes. I’m not saying the other classes are not important (GSM makes accessories, ARM makes CUL & ALC tools, CRP makes some boots, LTW makes belts, some boots, clothes & hats), but WVR & BSM are just wonderful to have. People tend to neglect & underestimate the power of food. At levels as low as 10 to 15, perhaps it’s not that important. But eventually, you’ll learn that having good food feels like having an extra 10% power for everything (crafting, gathering, dungeons etc). And you level 3% faster for everything too. The most important of all is that you get Steady Hand II at level 37 CUL (see Ch10: Cross Class Skills). This is one of the most important cross class skills you’ll ever learn. If you don't have access to good food yet, or if you don't feel like wasting your expensive crafting food. You can still use a STONE SOUP at any time. It cost only 37 gil, but it adds up to 17 CP for 30 min, which can be very powerful when you try to HQ something. Do not underestimate the power of 17 more CP. At end game crafting, veteran crafters pay millions of gil just to overmeld 1 to 2 more CP onto their gear. That's right, 1 or 2 CP can actually mean something to a master crafter. So please don't complain about a easy 17 CP. In addition, it adds 3% bonus exp, which is very nice. Don't underestimate the power of 3% bonus as well. When you're leveling so many classes from 1 to 70, 3% bonus exp is A LOT. Stone Soup - 37 gil for 17 extra CP, plus faster leveling! Why not? Stone Soup is sold by Alehouse Wench at Buscarron's Druthers (South Shroud 17, 19) and Grege at the Gold Saucer main counter. Unless you are already a billionaire, it is quite important that you take up at least 1 gathering class to support your crafting classes. Instead of buying all your mats (crafting materials) from the market board, you can get mats for free if you have gathering classes. It’s a lot of work, but if you think you can handle, feel free to take up more than 1 gathering class. Having a gathering class also means that you can have a gathering retainer to do the work for you using ventures, which will also benefit your crafting & income too. As a quick reminder, please explore each of the crafting guild's mat supplier & vendors at market place for cheap crafting mats. Don't do what I did: I once bought a Chicken Egg from the market board for 300 gil when I could have bought it at the vendor right next to the market board for 5 gil. Retainers provide storage space, sell items on the market, and gather raw mats to empower our crafting via "ventures". It is very beneficial to own lvl 50 retainers as they can help gather a great variety of things including shards & crystals for crafting. We can have 2 retainers for FREE in the game. 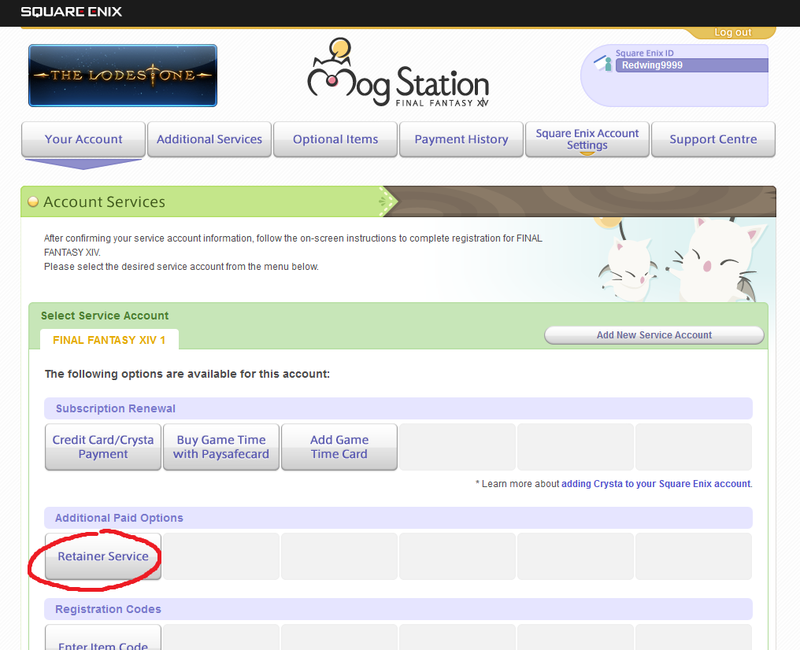 But we can all have up to 4 retainers if we just pay an extra ~$2 per month in our S-E subscription. I have 2 lvl 50 MIN retainers, 1 lvl 50 BTN retainer, and 1 lvl 50 hunter retainer (Pugilist. Retainers cannot acquire Monk job. They cannot equip soul crystal. For this reason, we should save up a set of i100+ gear for our hunter retainer). It seems to work optimally for me, since this arrangement covers everything. If you don't plan to have 4 retainers, set 1 retainer as either a MIN or BTN, and set the other 1 as a hunter. Keep in mind that both hunter & gatherer retainers can only be 5 levels below yourself, except when you're lvl 50, which they can reach lvl 50. Due to this reason, it is of utmost importance that you set your hunter retainer same as your main DoW/DoM, ideally a class at lvl 50. For the gathering retainer, set it to the same class as your strongest DoL. DO NOT try to diversify by setting your retainer to a BTN if you're a MIN. It won't work! For hunter retainers (DoW/DoM), their average ilevel matters a lot. I suggest you get them to at least avg ilvl 80+ when they reach lvl 50 (need ilvl 85+ to get Silver Dye. ilvl 90+ can get rare minions.). For MIN/BTN, the stats "GATHERING" is what matters. Many people don't know, you can actually buy extra unique untradable mainhand gathering/crafting tools (blue background tools, obtained from guild masters by completing lvl 50 class quests) from the Calamity Salvager. E.g. If you're a MIN, and you own a Mammon, you can give the Mammon to your retainer, and then buy a new one for yourself from the Calamity Salvager. This way, you can dramatically increase your retainers' gathering stats. For me, I even did some melding of gathering materia on my retainers' gear. Before I did these things, my lvl 50 MIN retainer was only bringing me 20 level 45-50 items per run. But after I gave her a Mammon & some materia melds, she brings back 30 items per run. The Mammon & Rauni (Level 50 Class Quest Reward). Extra Mammons /Rauni can be easily bought from the Calamity Salvager (Location: Limsa 11, 14; Uldah 12, 13; Gridania 10, 8) for your retainer. I shall start off with some basic information here first. I'll try to run through them as brief as possible, then we'll proceed to the more advanced sections. As everyone knows, crafting is simply: Within a given amount of durability (durab), use touches to hit 100% on the quality bar & use synthesis to hit 100% on the progress bar to complete the craft. 100% quality bar will guarantee you an HQ item (high quality), which has better stats than an NQ one (normal quality). A crafter has 3 kinds of stats: "Craftsmanship" contributes to the strength of your synthesis, "Control" contributes to the strength of your touches, and "CP" (Crafting Points) allows you to use different crafting skills. The RNG (random number generator) of FF14 is your greatest enemy. You can hit 96% quality, and it can sometimes still give you NQ more often than you expect. So you should always try your best to hit 100% quality. - A graph showing how HQ rate is calculated from the % completion of the Quality Bar. When the Quality Bar is 50% filled, you only get 15% HQ success rate. However, an exponential increase occurs when the Quality Bar is between 70% & 80%. After that, it slows down again. When the Quality Bar reaches 95%, the HQ rate becomes somewhat linear. These are skills that you will acquire at level 15, 37 & 50 of each crafting class. Each crafting class has its own unique "Cross Class Skills". As its name suggests, once a Cross Class Skill is acquired, it can be shared by all crafting classes. If you don't know how to set up Cross Class Skills for other classes, please visit 1 of those Basic Crafting Guides listed above. After these, you should acquire Manipulation (GSM 15), Careful Synthesis (WVR 15), Rapid Synthesis (ARM) and all other level 15 skills. OK, enough basics. We’re now moving on to advanced mode… I am not just going to explain how to use these Cross Class Skills in the most basic terms, but I’m also going to explain how these skills can benefit higher levels of crafting… hopefully giving the reader some inspiration. Arguably the best level 15 cross class skill, Waste Not lets you consume only 5 durability for touch/synthesis for the next 4 steps. So Waste Not basically breaks down 20 durab into 4 pieces, so that you decrease only 5 durab for each touch/syn. This is probably the most CP-efficient way to add more touches/syn at lower levels. Beginners will soon learn that this skill is much better than Master's Mend. The cool thing about WN in advanced crafting is that you can leave 5 durab hanging. 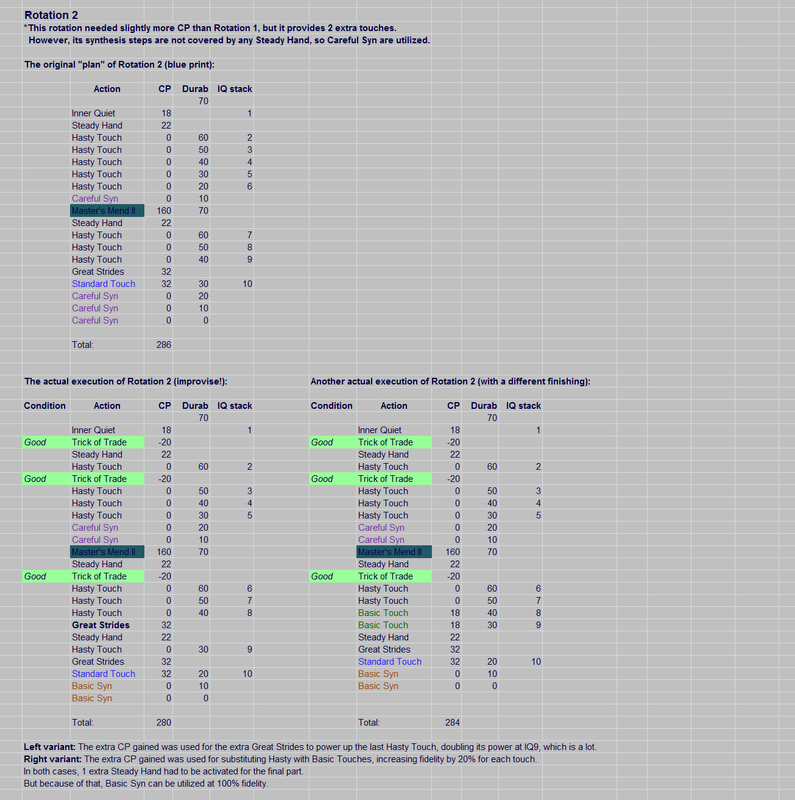 Let’s say, if you have 15 durab left when a WN is over, it’s actually equal to having 20 durab (See WN Case 1 & 2 below). Taking a “Trick of the Trade” (ALC lvl 15. See below) under WN is of course not ideal, as it consumes a step, but usually 1 Trick is ok, as it leaves the 5 durab hanging. This skill is extremely powerful for any 80 durab items, even for 2 star items. - In both WN Case 1 & 2, you're able to touch 5x & syn 1x. But in Case 2, you're able to take in a Trick of the Trade for an extra 20 CP, which allowed you to substitute the last Basic Touch (under Great Stride) with a Standard Touch (of which its power is doubled because of the Great Strides before it). Be very careful if you plan to use WN TWICE in a rotation though. If you have already taken a Trick in the 1st WN, leaving 5 durab hanging, you cannot take another Trick in the 2nd WN. Else, the 5 durab will be "neutralized", and you actually lose a touch. This means your 2nd WN would only have bought you 1 extra touch instead of 2 with that 56 CP spent. Anyway, an alternative to using WN multiple times would actually be Master's Mend II (MM II) if you have enough CP for it. MM II is actually more CP efficient than WN. However, it has to be an item with more than 60 durability. And you gotta make sure you have enough CP to do everything else after performing MM II. Both Case 3 & 4 give exactly the same outcome. Thus, it is ok to to take a trick between Steady Hand & Waste Not, as long as you sacrifice 1 step of WN. Keep in mind if you used the method in WN Case 4, you should NOT be taking another Trick if another Good pops during WN. Otherwise, you lose a step of touching. If CP is not an issue, and if your planned to use all Basic Touches under WN anyway paired with a Steady Hand II to reach 100% fidelity, then I actually suggest not to take any Trick in the whole WN phase. This way, you can guarantee 4 successful touches covered by the Steady Hand II, instead of just 3. Restoring 10 durab after each step for the next 3 steps. This skill has some similarities with Waste Not. Both skills can reduce the decrease of durab so that you can touch more. So why is this requiring 32 more CP? That’s because there are a few things Manip can do, but WN cannot. 1st e.g., to utilize a Waste Not (WN), you need 20 durab, and you can touch 4x in there. But if you use Manip, you can touch 4x, and your durab will only decrease by 10 (See Manip Case 1 - 3 below). 2nd e.g., if you do something like a Steady Hand or Trick of Trade in the middle of Manip (which doesn’t consume durab), you will actually GAIN 10 durab, provided your durab is not currently at max. 3rd e.g., If you activated Steady Hand, and is about to use WN, but a Good condition popped, you can’t really make use of the condition. If you don’t immediately use your WN, you won’t have the following 4 touches covered under the Steady Hand. But for Manip, you have flexibility. After you use Steady Hand, if you get a Good condition, you can touch first to make use of the Good, and then do you Manip after. At the end you’ll still only lose 10 durab from 4 touches (See Manip Case 1 - 3 below). This skill is not so great at low levels when CP is a big issue, but it is particularly important for starred 40 durab items. - In Manip Case 1, the position of WN is inflexible. Therefore, you cannot make use of the "Good" condition for touches. In Case 2, Manip is used, and it results 10 less decrease of durab. In Case 3, the position of Manip is moved, so the 1st Basic Touch was able to take advantage of the "Good" condition. The resulting durab decrease is unchanged in the end. IMPORTANT: DO NOT use Manip when your durab is down to 10 or 5. Manip restores 10 durab AFTER each step. If you're only 1 step from having 0 durab, your item will reach 0 when you touch, and botch before Manip restores the 10 durab. The only exception is if you know you will immediately use a skill that does not consume durability after the Manip, like Steady Hand II. Then it's OK to let durab fall to 10 or 5 before using Manip. Yes, I know this skill has only 50% success rate. But it’s equal to a Basic Touch that requires no CP, and that just makes it useful in many ways. Most of the time, you wanna pair this up with Steady Hand (+20% success), or even better, with Steady Hand II (CUL lvl 37) (+30% success). Sometimes, you spent all your CPs, but still have some extra durability left. Then it really doesn’t hurt to test your luck even if you use it without Steady Hand. This skill is not that useful for 1 star & 2 star crafting due to its low fidelity, but it’s indispensable for 3 & 4 star crafting, when CP is a big issue. Everyone knows the pain of Basic Syn having only 90% success rate. That 10% always gets to you at the wrong time, right? Well, sometimes you can get away with Careful Syn. It provides only 90% progress, but it has 100% fidelity. You can back-calculate to see if you can finish your craft with CS. Let’s say you know your Basic Syn gives 84 progress. Then 90% of 84 would be 75.6. Remember this: ALWAYS round off to the lower number, so in this case, CS gives 75 progress. If you can do your math right, you can use less Basic Syn. Therefore, in some cases, you may use one less Steady Hand and save 22 CP for an extra Basic Touch instead of a Hasty T. This skill, however, is completely replaced by Careful Syn II when you acquire it at WVR 50. Trading a Good condition for 20 CP. We all love CP! It’s like free food! Everyone loves it! This skill is extremely helpful in so many ways, especially in 3 & 4 star crafting. But just be careful where you take your TTs. Over-taking of TTs at the wrong time will ruin your chances of touching. It’s like eating too much free pizzas, and you’ll end up getting sick. Rumination turns an Inner Quiet stack into CP. At low levels, before you have Byregot’s Blessing, this is very useful. Together with a few lucky Tricks of T, Waste Not, Hasty T & Master Mend, you’ll be able to significantly lengthen your crafting rotation… and longer crafting rotation just means bigger chance of having more TTs, thus you’ll end up with a lot more CP and touch more in the process. You can have fewer than 250 CP, and still capable of touching 9 to 10 times on a 40 durab item (See spoiler below). Rum can just make the impossible become possible! Nevertheless, after you have acquired Byregot’s Blessing, you can completely ditch Rum. Both Rum & Byregot use up the IQ stack, so you can only pick either one, and Byregot is just better. Ingen lowers an item level so that both quality & progress are increased per touch or syn. It helps if you have no other skills to use, or if you're just lacking a tiny bit of craftsmanship to complete an item in 1 or 2 shots of synthesis. But the impact is small. So it's not a very useful skill in general. And when Ingen II kicks in at BSM lvl 50, Ingen I is almost completely replaced. Ingen II, however, is nearly necessary for anything beyond 1 star. Increase success rate by 30% in the next 5 steps. This is pretty much the only important level 37 cross class skill, and it’s really worth your effort to get it. The extra 10% of success rate over Steady Hand is enormous. With this, you can have 100% fidelity with Basic Touches. DO NOT underestimate the importance of BTs. Some people tend to neglect BT when they have acquired Standard & Advanced Touch. But you need to know that having many BTs in a rotation is the key to a strong Byregot's Blessing. Therefore, 100% fidelity for your BTs means 100% fidelity for your Byregot's powers. It makes the HQ-ing of your items more consistent & predictable. SH II also makes your Hasty T slightly more secure than using SH, reaching up to 80% success rate, which is critical for 3 & 4star crafting. Increases base control by 50% for the next 3 steps (including control gained from food, but excluding control gained from Inner Q). Needless to say, this skill is golden. The best combo I love is Great S, SH, Innov, Adv T, Great S, Adv T, Great S, SH, Innov, Adv T. If you have sufficient stats, it’s one of the fastest ways to push quality up on a low level item within 3 touches. Apart from this quick 3 touch use, Innov is also a wonderful skill to be used before a Byregot. If planned well, sometimes you can even share one Innov between the Byregot and the touch before the Byregot by fitting a Great Strides in between. 100% success rate, 120% progress. Can anything get better than this? Once you have this, you can completely substitute the Basic Syn button for any level 50 crafting class with this. Congrats! You can now remove the ever-annoying Basic Syn button (a.k.a. BS button, yes, it’s absolute BS) for eternity! Investment of 66 CP, but gain back 8 CP for each step in the next 10 steps, i.e. gaining back 80 CP, resulting in a net gain of 14 CP in the end. When my friend first got this, she was like, “This is so useless! All that hard work for ALC 50 just for a few CP? I regret taking ALC!” I was like, “Are you serious? 14 CP is a lot!” At high levels of crafting, even 1 CP is important. We overmeld materia like crazy on our gear just to squeeze out that 1 extra CP. So pls don’t complain about a free 14 CP. I can’t say CZ is necessary, but it is very important for anything beyond 1 star. In 3 & 4 star crafting, think about using this 2x! Just be VERY careful to make sure you have enough steps to gain back the invested CP. If you miss 1 step, you only get back 72 CP, thus only a net gain of 6 CP. If you miss 2 steps, you actually lose 2 CP with this skill. Increases quality at 100% efficiency, plus 20% for each bonus to control granted by Inner Quiet, performed at a success rate of 90%... Turning a big IQ stack into a single ultra-powerful touch at the cost of only 24 CP. BB is almost every crafter’s favorite. I call this the “Kamehameha” (google this if you don’t know what it is) of crafting. It’s true! You build up a stack of IQ, set up different buffs like Great S, Innov, Ingen etc., then BOOM, you send out your BB and fill up like half the quality bar all the way till 100%. It is definitely a skill that is cool as hell. This is a critical skill for anything beyond 1 star. Decrease item level for the next 5 steps, resulting in the increase of the power of both touches & synthesis. While WN is better than WN II, Ingen II is actually better than Ingen. You can get away with not using Ingen or Ingen II for 1 star 80 durab items. But you can’t get away with Ingen II for 1 star 40 durab, 2 star or higher. The more difficult an item is, the more important this skill becomes. The bonus quality it adds is small, but the progress per synthesis is almost doubled with Ingen II for 1 & 2 star items. Completing 1/3 remaining progress in one step at 90% success rate, ignoring craftsmanship and/or buffs. This skill was useless before Patch 2.2, since everything could be one or two-shotted under Ingen II back then. Probably that’s why they made it useful now for 3 & 4 star crafting. Don’t try to use this skill under Ingen II. It won’t make a difference. This skill is also essential for high level furniture. Without this, you cannot complete the very difficult 3 or 4-star furniture. 90% chance of reclaiming your mats when synthesis fails. The idea of retrieving mats may be considered when we deal with much more precious mats for 2 star or 3 star crafting. However, the 2 problems of Reclaim are that it costs WAY too much CP (55 CP) and it only has a 90% success rate. When we deal with 3 star crafting, usually we do not know if we can HQ it or not until we finished our Byregot. But when we actually see our final quality being too low after the Byregot, we'll have no CP left to Reclaim. In contrast, if we try to Reclaim earlier, then it practically consumes all your CP and RUINS the rest of the synthesis (The true art of "Reclaim or not" lies in your ability to predict how much quality you can gain from the Byregot phase depending on how many IQ stacks you have & what buffs you can use with your remaining CP. Please visit the data chart in Ch28 for quality prediction calculations, and then use the graph in Ch8 to predict the final HQ rate. If your final HQ rate is way below 60%, you can consider Reclaim instead of proceeding to the Byregot phase. You may also try using this crafting simulator to help predict the outcome: http://www.ffxivcrafter.com/crafting.php). Sometimes the mats are so precious that it's absolutely devastating when we lose everything from a failed Reclaim. Yet, this is not uncommon with the notorious RNG (my life-time enemy!). I have lost a Cashmere Fleece before with Reclaim. Another friend of mine tried to Reclaim a Cashmere Robe of Casting once, and lost EVERYTHING. So the Reclaim button is asking us: "Do you wanna go on NQ this? Or do you wanna risk losing everything so that you may have a chance to try again?" Is this a useful skill? You decide. Conditions have nothing to do with synthesis (i.e. progress), and has everything to do with touches (i.e. quality). These are basics, so please visit some basic crafting guides if you need help. Good conditions pops up at about 1/4 chance (which feels like 1/6). Excellent pops up at about 1/20 chance. Conditions Rule 1 - After a Good condition, it's always followed by a Normal condition. Conditions Rule 2 - After an Excellent, it's always followed by a Poor, and then a Normal. Conditions Rule 3 - A touch at a Good condition adds extra 50% CURRENT QUALITY. Innovation, in contrast, adds extra 50% BASE CONTROL. When Inner Quiet (IQ) is 1, they are almost identical. However, when IQ is more than 1, Good condition will always give a higher bonus. Therefore, if you're about to use Innov before a touch but encounters a Good condition, skip the Innov. Even if you plan to have Ingen II after Innov to further buff your Byregot, the bonus coming from a Good condition is still better, provided that the IQ stack is high (like 6 or above). Therefore, usually, Good > Innov + Ingen II. Conditions Rule 4 - A touch at an Excellent condition gives 4x quality of that from a touch at Normal condition. Therefore, if you're about to use any kind of buff before a touch or a Byregot, even if it's Great Strides or Ingen II, skip it. Do your Byregot first, then use your Ingen II afterward if necessary. Conditions Rule 5 - A Basic Touch under Good condition (150% efficiency) is more powerful than a Standard Touch under Normal condition (125% efficiency). Therefore, in some situations, it is better to not take a Trick of the Trade, but use the Good condition for a touch if you're not in desperate need of CP. - Normal condition = white orb. - Good condition = red orb. - Excellent condition = color-changing rainbow orb. - Poor condition = purple orb. Approach 2 - To be wasteful in CP, but pushes out the strongest touches within the shortest time. Each 10 durab spent will be used to greatly increase quality. This approach is used when you have sufficient stats (i.e. if you're a well-geared level 45 working on a level 30 item). This combo burns all your CP fast, but also pushes quality extremely fast by maximizing the strongest quality skills. If you have enough CP, you can repeat this combo twice in a rotation. If you don't have Advanced Touch yet, you can use Standard Touch. And if you don't have Innovation yet, you can skip it. Approach 3A - To be extremely conserving in CP, by pushing out as many weak touches as possible to build up a high Inner Quiet stack. Then spend most of the CP on recovering durability, and then continue to push out more touches until finally use Rumination to recover one last pool of CP, before finishing up with the last few touches (without Inner Quiet) and synthesis. This approach is used before Byregot's Blessing is acquired. ...where one Hasty Touch could be replaced by Trick of Trade if a "Good" condition pops up. Approach 3B - To be extremely conserving in CP, by pushing out as many weak touches as possible to build up a high Inner Quiet stack. Then spend most of the CP on a "finisher phase" consisting of 1 or 2 buffed strong touch(es). This approach is also used before Byregot's Blessing is acquired. Approach 4 - To be extremely conserving in CP, by pushing out as many weak touches as possible to build up a high Inner Quiet stack. Then spend most of the CP on a "Byregot phase", where you activate multiple buffs to power-up your Byregot's Blessing, releasing your "Kamehameha". This approach is used after Byregot's Blessing is acquired. Before I keep talking about crafting, I want to talk about martial arts… or at least “fantasy martial arts”. Many of you are probably Americans, Australians, Europeans or even Japanese who have never heard of "Jin Yong’s Wuxia novels". Jin Yong (a.k.a. Louis Cha) is a famous Chinese novelist who wrote a number of famous “Wuxia” (fantasy martial arts) novels, and the stories have been so deeply rooted in the Chinese community for over 20 years that they have been publish in many different forms including comics, TV-series, movies etc. One of such novels was “The Smiling, Proud Wanderer”. In this novel series, the protagonist, Linghu Chong, by chance learned a very formidable sword style called “Nine Swords of Dugu” (The Nine Swords of Solitude). To learn the Nine Swords of Dugu, Chong at first had to learn 9 different basic sword techniques. After mastering each technique to its fullest, and able to perform them in “combos”, he was told to FORGET them all… The essence of the Nine Swords of Dugu lies in the ability in detecting the enemy’s techniques’ weaknesses, and then immediately formulates a technique/combo on the spot that targets them. Thus, it’s not bound to any particular forms or combinations, and is ever-changing. People cannot even steal or try to copy Chong’s “Nine Swords of Dugu”, because there was no particular technique or combo to steal from! It also makes the sword style unpredictable in fights. This is a great philosophy that applies not only to martial arts, but even to our real lives. My philosophy of crafting is very similar. First, we have to grind and learn each individual basic crafting skill or cross class skill. Then we need to understand thoroughly what each skill does, and practice with them. Then we combine them into “combos” for use. When we plan for crafting something, we first have to measure our abilities: Find out what’s the minimum number of secure steps it takes for us to complete the item. Then we draft out a “blue print” (strategic plan)… i.e. a planned rotation that can utilize all our CP to the fullest. But when the actual crafting happens, we have to react on the spot according to the situation. As you can see in these examples, in response to the "Conditions", one has to constantly modify their rotations to make them more powerful. Do not underestimate your abilities as a crafter just because you are only level 20-ish. It takes some real skills to be a good crafter even at lower levels. The smarter crafter who can improvise will always be slightly stronger than those who cannot. The fastest but also the most expensive way to level crafting is by "Leves". You're basically trading your gil for fast EXP (So if you're poor, then don't use this method! You have a choice! Don't do this and then complain about being poor!). Leves for crafting classes are called "Tradecraft Leves", which can be taken from the "Levemete" guy in the Adventure Guild of every major city. The available Tradecraft Leves in each city corresponds to the crafting class which you can pick up from that city. Therefore, GSM, WVR & ALC leves will be in Uldah's Adventure Guild. BSM, ARM, CUL leves will be in Limsa etc. In Tradecraft Leves, the Levemete will ask you to submit certain crafted items to a particular guy in town or out of town, and you will earn crafting exp in exchange. Any HQ items you submit will earn you double exp. Thus, to conserve your leves allowances, it's always better to submit HQ. However, if you have a lot of leves allowances to spare, and if the NQ just happened to be something that can be easily obtained through certain guild supplier/vendor, you may consider submitting a large amount of NQ items instead. (1) Repeatable leves: This type of leves usually requests a total of 3 identical items, and then after you submitted them, the guy will ask if you want to submit more. If you pick no, the leves ends here. But if you click yes, you can submit 3 more items. After that, the guy will ask you 1 last time if you want to submit more, and you can submit for the 3rd time. This whole process of 3 submissions will only cost you 1 leves allowance. Hence "repeatable". This type of leves is good if you have a lot of that particular item for submission, like ingots, lumbers or even fishes, which you may have a stack of 30 to 99 in hand. If the requested item is actually a gear/accessory, then it is not so ideal as it'll be very inconvenient to make and carry them. 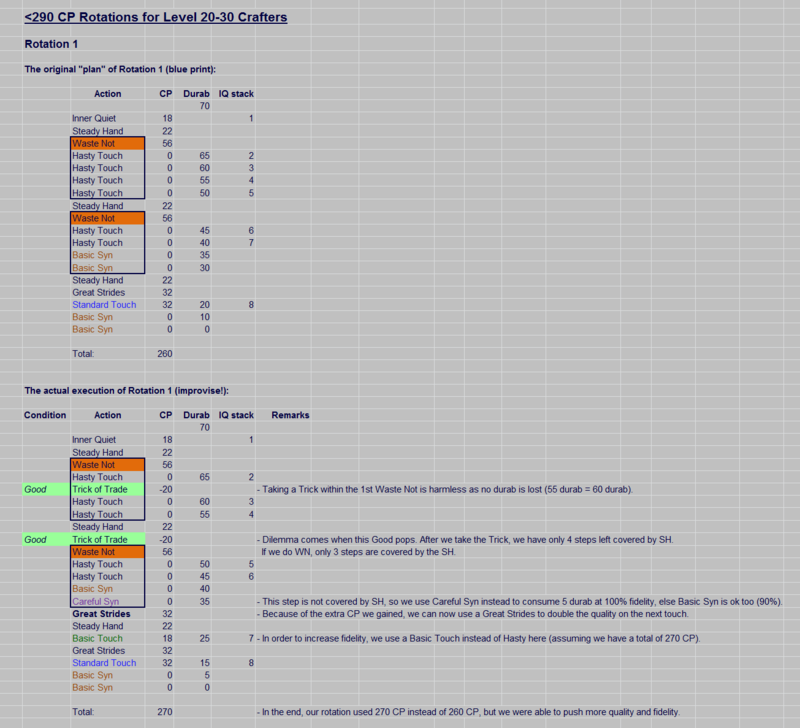 Also, this type of leves tend to give slightly less exp than the other 2 below. (2) Local leves (non-repeatable): This type of leves requests only 1 item to be submitted to a guy in the same city. This is usually my favorite type of leves, as you don't need to make too many items, and the submission is local, making it convenient. Even though we call it "non-repeatable", you can actually take it as many times as you want. But it'll cost you 1 leves allowance each time. (3) Traveling leves (non-repeatable): This type of leves requests only 1 item to be submitted to a guy in a nearby town. This type of leves gives the best exp per item, but it can be costly if too much traveling is involved. Similar to local leves, it costs 1 leves allowance each time, but you can do it as many times as you wish. (1) If you hand in an HQ item, the exp & GC seals earned will be doubled. (2) If the requested item has a gold star marked next to it, then the reward earned is also doubled. (3) If the item has a gold star, and you hand in HQ, then the reward earned is QUADRUPLED (4x)! And this is one of the fastest way to earn GC seals! Even after maxing all my crafting classes, I still occasionally do these provisions to earn GC seals. If I am out of time, I'd just do the ones marked with the gold stars. The most solid way to level your crafting classes is the most classic way - just by crafting out every single item on your crafting log. Do not underestimate this. Yes, this is a longer path comparing with Leves, but this is also the most solid way for you to actually learn how to craft. And guess what? You're earning gil through this process instead of burning gil like you do with Leves. Back then, I was a silly noob who didn't even know about the existence of Leves. Thus I leveled 4 classes to level 50 without doing a single leves. But because of that, I became good at crafting, and also earned lot of gil for buying materia. Up until now, the most successful crafters I know are still the ones who actually took the time to craft out every single item on their crafting logs. Most of the time, I used my Miner/Botanist to gather huge amounts of ores/logs, and I would craft out a whole stack of HQ ingots/lumbers (40 durab items). Sure, you can quicksyn too, but quicksyn is also a very wasteful action. It burns though your mats and shards, but only gets about 1/4 of exp comparing to manual crafting when you push quality. I highly recommend you practice your crafting of HQ ingots & lumbers (40 durab item). Sell the HQ ones for gil, use the failed NQ ones for making HQ gear/weapons/tools, going through the crafting log. Then sell all those HQ items as well. You will become a BETTER CRAFTER this way, and you will be EARNING GIL while leveling. Just remember, if you're leveling crafting classes by crafting, make sure you eat some food to increase exp gain by 3%. Also if you have enough Grand Company Seals, think about buying a "Company-issue Engineering Manual" from the GC. It gives a lot more exp when you craft. If your your FC is willing to spend FC credits, FC buff is also a nice exp bonus (can provide up to 10% bonus exp). Also, wealthy FCs are usually equipped with "crafting stations" in their FC houses. There are 8 different stations for 8 crafting classes. When you click on the corresponding station, you will be given a 10 CP bonus as long as you're level 60 or lower and as long as you stay inside that house. - Company-issue Engineering Manual, 1440 GC seals, provides 50% exp gain, with a cap of 20,000 total extra exp provided before vanishing. (1) You can get crafting exp if you're not level 50 yet. (3) You can get the Ehcatl Smithing Gloves, which saves you from overmelding multiple class-specific end-game gloves. Unlike other beast quests, Ixali quests consist of much crafting & gathering tasks. You'll be asked to craft many items using the Ehcatl Wristgloves that were given to you at the beginning. The gathering tasks only require low level gathering classes, but the crafting part gets pretty hard towards higher ranks. At Respected, you’ll be able to take 3 quests in Mor Dhona. You obtain 1 oaknots per quest, and up to a total of 3 oaknots per day. At Honored, in addition to the 3 Mor Dhona quests above, you’ll be taking 3 quests in Coerthas Highland, and obtained 6 extra oaknots/day (2/quest). This makes Honored rank able to gain up to 9 oaknots a day. At Sworn, you’ll be able to buy Ehcatl Smithing Gloves (10 oaknots) & Ehcatl Sealant (a.k.a. Quick-hardening Sealant) (8 oaknots, see later Chapter), which is a key item for obtaining the new Artisan's Offhands/Apron/Mitts/Culottes/Sandals (see Ch25). Ixali Tips 1: Use a level 50 crafting class to craft out your quest items, but switch to your lower crafting classes before you hand in your quests. This way, you can easily handle the quests, but gain benefits of exp for your lower classes. Ixali Tips 2: At Rank 5 (Respected), a handicap will be placed onto you to ban you from using any cross class skills. My way of doing it was to use Weaver. I simply push quality with Great S + Advanced T under Steady H, and then let Careful Syn II finishes up with ease. Ixali Tips 3: At Rank 6 (Honored), you'll receive either cross class handicap or CP handicap. Things like Isolator Components are quite demanding in quality for the CP handicap that the quests impose on us (Since Patch 2.5, they have significantly reduced the difficulty of Isolator Components. It may be good news for you, but I think they removed even the only challenge in Ixali, making it extremely boring now.). Make sure you DO NOT activate multiple crafting facilities at the same time. The CP handicap will stack, and you’ll end up with like 99 CP if you take up more than 1 crafting facility. After you finished each component, right-click onto the facility icon at the top of your screen to dismiss it before you take up the next component. There will not be enough CP for Comfort Z for these quests, so skip that. Start with Inner Q, and do your best to build a small IQ stack using Steady H II, Waste Not & Hasty T. Take some Tricks if you can, and push out a Byregot with Great S to wrap it up (You may not even need this anymore... too easy now). Lliana Hylrin and Fybrile like this.